Sign & Banner is responsible for the production of graphics, foam-core mounting, lamination and signage in campus. To request any of these services please fill out the online form available in the Learning Resources web pages. Each of the services provided requires the users to understand the capabilities of the Department and the responsibilities of the requestor. + Largest printable size is 57”x142”(paper only). Mounted on foam board posters not bigger than 40”x60”. For questions regarding sizes, materials & pricing please contact the department. Buildings 1, 2, 3 | 32" x 88"
POSTERS: Advertise your event with a colorful and informative poster. 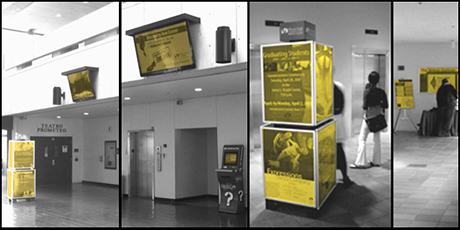 SIGNS: Our eye-catching signs can help advertise events for students. DISPLAYS: Display’s are a great way to educate and inform. Mon - Fri: 8:00 a.m. – 5:00 p.m.